Hoa Young has worked for the City for over 25 years, starting out as an aide in the Mayor’s office. Since then she has worked as a Project Management Technician for PED in the Annex. 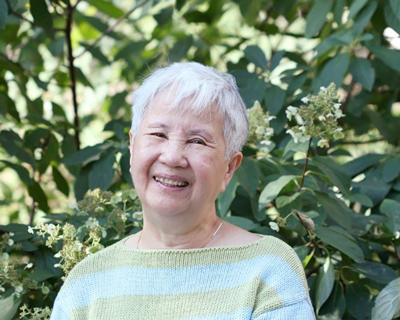 Hoa has grown to appreciate the importance of staying active and eating well as she ages. She doesn’t have an extreme exercise program but rather does what she describes as low impact, age appropriate exercise which anyone could do. To start with, Hoa lives in Lowertown and walks home approximately one mile from work most days. She participates in the free, lunch time Pilates class offered at City Hall. She may not do the whole hour but she finds 15-20 minutes helps clear her head and reduces any stress she is feeling. The instructor, Anca Sima, supports her in doing what works for her, saying doing anything is good. Hoa feels that – you have to move it or lose it. Three years ago, Hoa began taking T’ai-Chi Qigong class. She goes most Sundays along with her husband to the Saint Paul Yoga Center for these classes. The philosophy behind Tai chi Qigong is based on the concept of five elements with (metal, wood, water, fire and earth) each element representing certain organs in the body. The exercise consists of deep breath, flowing movements and meditation to draw the Chi (energy) to the body to keep the organs healthy. In terms of eating, Hoa strives to maintain a healthy weight by just watching what and how much she eats. She aims at eating simple, balanced and healthy food. She mostly cooks Vietnamese food that consists of rice (blending white and brown), meat and fresh vegetables. In the morning, she may have a half bagel with cream cheese or a yogurt. A small handful of nuts will serve as a snack during the day and before bedtime, or cheese, crackers and fruit. Tofu is a staple in her kitchen. Recently Hoa started teaching cooking classes at Mississippi Market’s Eastside location. She likes to share her passion for cooking simple and healthy food and mostly authentic Vietnamese cuisine. Her next class is in October, “Vietnamese Chicken Three Ways”. You can find out more here: msmarket.coop/event/vietnamese-chicken-three-ways. Hoa is also adventurous in trying other cuisines of the world. She cooks Thai, Chinese, Italian, French, Korean. Her favorite thing to do is to watch cooking shows early Saturday morning. Hoa understands that keeping a healthy lifestyle can take discipline; but after a while it becomes a habit. She also feels that emotional health is also important to living a long, healthy life so Hoa tries to focus on the positive things around her. She reminds herself daily of the good fortune of having a good family with a husband of 48 years, three well-adjusted children and seven grandchildren. She believes there is really no reason to complain but be thankful for all she has.